Kathmandu - This week the media continued to focus on medical education in particular and education policy in general. The National Medical Education Bill(NMEB) was the primary issue of disagreement among parties causing an unusual situation in the parliament. It was approved through the House of Representatives and has been tabled in the National Assembly. The media also continued to regularly cover different aspects of the report submitted by the High Level National Commission on Education (HLNCE). Both the issues were followed by higher number of opinion articles and lettersto the editors. - The NMEB and Dr. KC’s fast-unto-death agitation (satyagraha )continued to flood the media this week as well. The percent of news about medical policy rose to more than 60% this week from more than 40% of all education related newsfrom the last week. It attracted front pages of the media and was also a topic for multiple opinion articles.More than 90% of the front page education news was about medical policy. The struggle in the parliament between the ruling party and the opposition party was wellcovered along with the history of the struggle and the political aspect of NMEB. An open letter to the parliamentarians by Dr. Gobinda KC was also published. An editorial called for the government to keep up the promise with the doctor. A full page cartoon series published in different phases of the 16thsatyagraha staged by Dr.KC was republished by Kantipur. Different letters were submitted stating that the government was playing the role of a broker in the medical education sector, and that the present NMBL was in favor of mafiaof medical sector. - The HLNCE continues to be covered in the media. It has been regularly covered in different ‘installments’ since it was submitted to the Prime Minister last week. Different aspects of the recommendations have become the headlines of the news and opinion regularly. An editorial appreciated the timely recommendation of the HLNCE to focus in the improvement of public schools for equity and better future of the nation. Separate news was dedicated to the recommendation of HLNCE about a separate examination for qualification to become a principal. It has recommended that there is a need to recognize that a separated set of skills then teaching is required to become a principal. It would be noted that the extent of follow up in any report or recommendation to the government, particularly in the case of education was a new phenomenon. 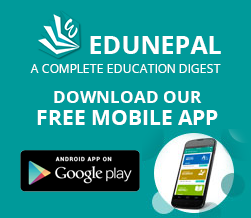 It can be identified that the focus of media persons on the aspect of education has increaseddrastically in recent times. - An opinion article to be mention here was titled ‘Mao’s failed sparrow strategy’. It related the private school conversion strategy suggested by HLNCE , to MaoTsetung's 'Four pest campaign' and ‘The Great Sparrow Campaign ‘under which all citizens were directed to kill sparrows among other pests considering it as one of the threats to agriculture yield. It caused severe environmental crisis and later China had to import sparrows from other countries. It states that similar impact can happen if private schools are eliminatedconsidering it as the only threat to public school. It emphasized that the government shouldnot compromise with quality of education for free education policy. The writer stated that 20% students of the private school have covered the overall quality of education in Nepal also recoveringfor 80% students of public schools. It mentions not to compromise with 80% quality maintained by private school for the improvement of 20% quality. The writer calls the government for deeper analysis for better improvement plan of public schools. It says the private schools have been improving the quality without any input by the government. It called that the focus of the government should be in uplifting public school and not degrading private schools first. The article highlights the threat of the recommended policy to impact in the quality of private schools, while calling for a guarantee to improve public schools’ quality. The statement that 80% of the children's quality shouldn’t be a matter of concern, as 20% of the students from private schools cover the education standard of the should be taken seriously albeit highly undemocratic and thus illogical. It might present a lame excuse to justify privatization of education. - 77 District Education Offices are being re-establishedby theMinistry of Education, Science and Technology(MEST). Previously, the government had reduced the role of the District Education Office. After the decision from the Council of Ministers, the MEST has send letters to all the units for the purpose. From such actions, the struggle of power between the federal and local units can be felt. It demonstrates that the federal government continues to keep it rein by retaining structuresof the centralized government.This can be regarded against the spirit of the federalization and will create conflict between the federal and other level of elected governments. Some view the retention of district-based structures of line agencies is the Trojan Horse of the centralized mindset of bureaucracy and the leadership in the federal state. - The above pictorial represents the effort of the local government and schools to bridge the gap between school and community, while at the same time bring respect and relevance to the traditional skills and profession. It’s a big leap forward to the schools to go back to traditional skills. - Interesting international news covered this week was about Duke University professor being removed over 'Speak English' email. A US university professor has been removed as director of a graduate programme, amid a criticism over an email she sent urging students not to speak Chinese in the academic settings. The news was published in BBC international and was also covered in Kantipur this week. It is a rare coverage of international incident in national dailies. The incident is timely to consider the racial aspect of restricting students to speak in their mother tongue. Schools in Nepal restrict students from using languagesother than English.This incident highlights the right to learn and use mother tongue in schools as well. It also represents the raising sensitivity of racial aspect of education system throughout the world. Other newsto consider this week was about the four villages of Jajarkot where hundreds of school aged children were out of school due to the lack of access to schools while the government had declared Jajarkot a fully literate district. 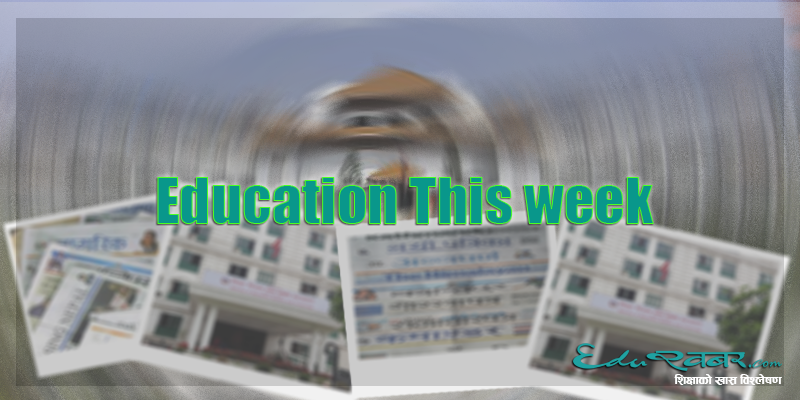 A report in HimalWeekly mentioned the improvement in the medical education sector after strict regulation as a result of ongoing civil struggle for its improvement. It also covered news about students being exploited by some medical college. The mayor of MadhyapurThimihas planned to work in collaboration with Private and Boarding School Organization of Nepal(PABSON)’s regional chapter for the improvement of public schools and to bridge the gap between private and public schools. This effort should be taken with caution, as the improvement of public school by copying the path of private schools might not be the best way ahead. This has been the general understanding among general public at the moment.